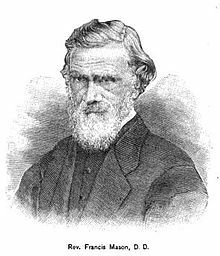 Today in Masonic History Francis Mason passes away in 1874. Francis Mason was an American baptist missionary. Mason was born April 2nd, 1799 in York, England. He was the son of a shoemaker and the grandson of a Baptist Minister who was the founder of the Baptist Society in York. At the age of 19, in 1818, Mason immigrated to Massachusettes. In 1827, Mason became a licensed Baptist minister. Three years later the American Baptist Missionary Union sent Mason to work with the Karens in Burma. Mason spent much of the rest of his life working with the Karens. He would translate the Bible into two of the Karens primary languages Sgaw and Pwo. He also tranlated three books of the Bible, Matthew, Psalms and Genesis into the Bghai. Mason was also a naturalist and spent time examining the flora and fauna in Burma. He would publish in 1850, The natural products of Burmah, or notes on the fauna, flora and minerals of the Tenasserim provinces, and the Burman empire. The book would be republished under various names. During Mason's time as a missionary he was almost removed from his duties due to some of his wife's beleifs. Among these beliefs was that God's way of speaking to Adam was revealed in the designs of the Burmese women's dresses. Mason was a Freemason, unfortuantely his actual lodge could not be verified.